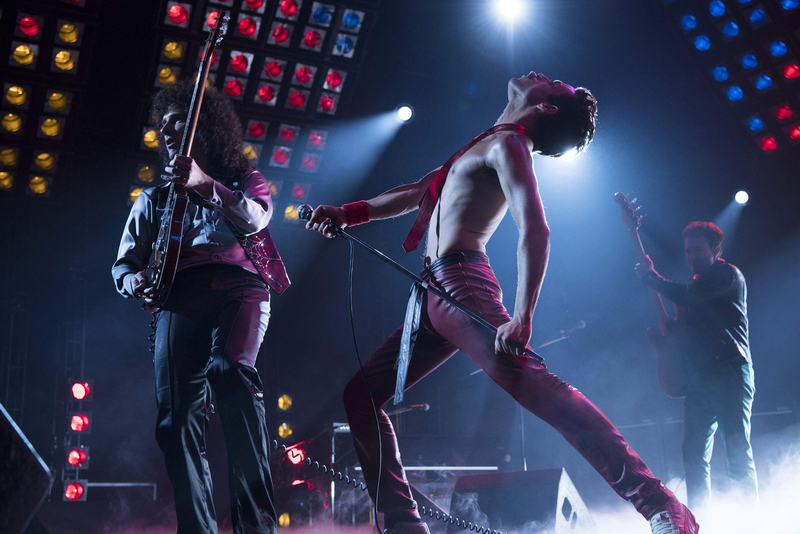 Fraught with a slew of behind-the-scenes dramas, the highly anticipated Queen biopic, Bohemian Rhapsody, hasn’t had the easiest journey to the silver screen. For starters, Sacha Baron Cohen, Borat (2006), was initially tapped to play flamboyant frontman Freddie Mercury before leaving the project, citing ye ol’ ‘creative differences’ with Queen members Brian May and Roger Taylor, who serve as consultants on the film, for the departure. Irrespective, casting Mercury was always going to be a challenge; it’s kinda like finding someone to play Michael Jackson or Gene Simmons. Fortunately, filmmakers turned to Rami Malek, the Egyptian-American actor from television’s Mr. Robot (2015), to take on the role of the catsuit-wearing bad boy, a part he was clearly born to play. If you’ve seen any of the promotional material, you’d already know that Malek is a dead ringer for the influential artist. What’s more, the 37-year-old manages to capture the electrifying energy and charismatic charm that Mercury was infamous for, despite not being as tall or lean. Either way, there’s never a moment I wasn’t convinced that Malek was the real deal. Furthermore, Bryan Singer, The Usual Suspects (1995), was also fired as director towards the tail end of production, after alleged trouble got him booted off set, the film’s cinematographer Newton Thomas Sigel, Drive (2011), taking the reigns until another director was found. Singer was eventually replaced with Dexter Fletcher, Eddie the Eagle (2015); his name, however, remains on the final credits thanks to DGA rules. Despite all of this, Bohemian Rhapsody is still an enthralling, albeit surface level biography, one that’s light on detail yet heavy on music, the whole thing elevated by some great performances and the infinite power of Queen’s iconic tracks. Penned by Anthony McCarten, The Theory of Everything (2014), who uses Queen’s stirring ’85 Live Aid performance in London as a framing device, Bo Rhap shows extracts of ‘Her Majesty’s’ story, focusing mainly on the life of Freddie Mercury (born Farrokh Bulsara), from his early days in Middlesex as a Parsi immigrant working as a baggage handler at Heathrow Airport, to his turbulent years as an egotistical pop-rock diva, before finishing up with his AIDs diagnosis in the late ’80s. Sure, the film plays it safe for the most part (thanks to its PG-13 rating) and doesn’t tell us any more than what we already know, but it’s never less than entertaining. When we first meet Mercury he’s following a local band called Smile (whose vocalist Tim Staffell (Jack Roth) has just quit), the musical virtuoso impressing guitarist Brian May (Gwilym Lee) and drummer Roger Taylor (Ben Hardy) with his four-octave vocal range, which he attributes to his large mouth and overbite (he had four extra teeth on his upper jaw). 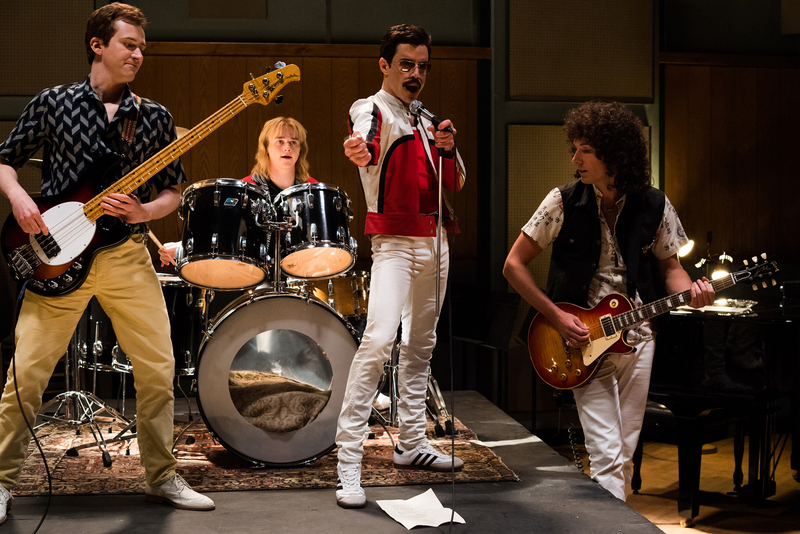 After bassist John Deacon (Joseph Mazzello) joins the group, Mercury renames the quartet and Queen is officially born, the extravagant lead singer later convincing his misfit mates to sell their dodgy touring van to get enough cash to produce a debut album, and the rest, folks, is music history, Queen’s unique style (which transcends traditional genre) eventually earning them a spot as one of rock’s all-time the greats. Guaranteed to blow your mind … Anytime! The absolute highlight, though, is the film’s extraordinary climax, a beat-for-beat re-enactment of Queen’s legendary reunion set at Bob Geldof’s Live Aid concert at Wembley Stadium in 1985, which has been called the greatest live rock performance of all time. Singing in front of a worldwide television audience of 1.9 billion, Malek dominates the stage as the male prima donna, strutting his stuff in his wife beater, signature armband, and chevron mustache as if he owns the world — it’s a sweeping, immortalizing sequence that’s guaranteed to blow your mind. Where the flick falters, however, is in its textbook depiction of Mercury’s inner loneliness, over-the-top party lifestyle and sexuality (he was known for being a promiscuous pansexual), the latter briefly touched on in a montage at a queer bar (during his gay leather days), and a handful of passing scenes with his homosexual lover Jim Hutton (Aaron McCusker). The lyrics, ‘Is this the real life? Is this just fantasy?’ seem fitting here, too, seeing as filmmakers play fast and loose with the timeline and particular events, such as Freddie’s HIV diagnosis, which is moved up two years for dramatic effect. 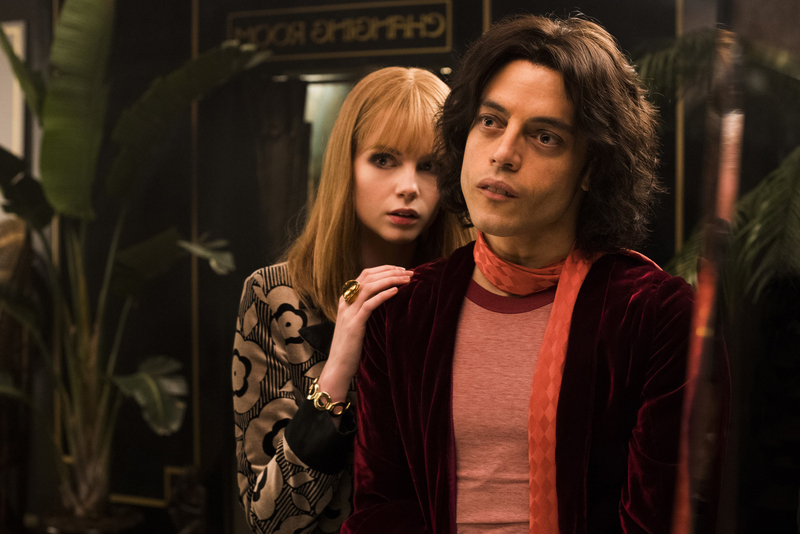 Besides Mercury’s love for cats, the only other scenes that ring true are the ones focusing on his complex relationship with fiancée Mary Austin, portrayed by the always wonderful Lucy Boynton, Sing Street (2016), who’s so tender and caring that even he struggles to break her heart after discovering (and accepting) his attraction to men while on the road. Given that May and Taylor executive produce the film, along with former Queen manager Jim Beach and producer Graham King, The Departed (2006), not every person is portrayed in an accurate light, mainly the smarmy Paul Prenter (Allen Leech), Mercury’s personal manager, who’s depicted as an antagonist of sorts, exploiting the singer’s generosity and baring the brunt of the blame for his downward spiral into drug and alcohol abuse. As you’d expect, Beach, who’s played here by Tom Hollander, Pride & Prejudice (2005), is rendered in a very positive light, so too are Freddie’s conservative parents, Bomi (Ace Bhatti) and Jer Bulsara (Meneka Das), despite being grossly underwritten. 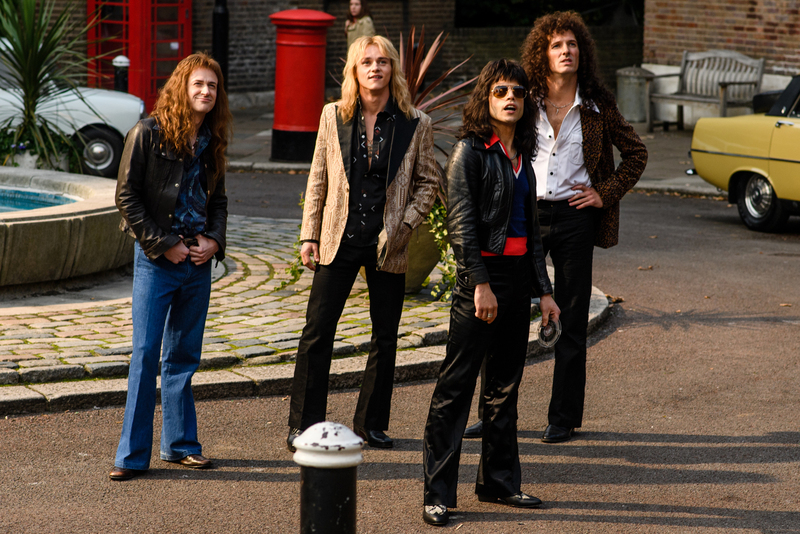 There’s a scene in Bohemian Rhapsody that points out the terrible initial reactions to the titular track upon its release, which kinda echoes the movie’s mixed reception after it was shown to the press. It’ll be interesting to see whether, just like the song itself, the film will mimic its success and live on amongst fans forever.